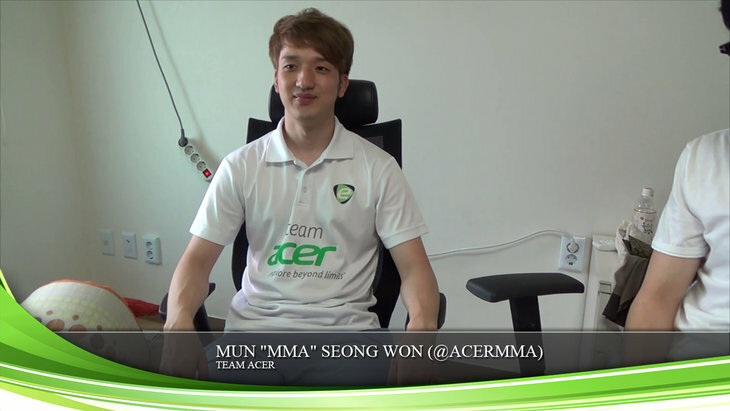 Mun " MMA" Seong Won, of Team Acer, is the star of the 77th episode of my's 'Grilled' interview series. - MMA's life as an SK Telecom T1 B teamer in BW. - Slaying Mvp in a GSL final in 2011. - Beating DRG in their classic GSL Blizzard Cup final. - Moving from having his personal coach in SlayerS. - Thoughts on players like Flash and Mvp. - His penchant for drop-heavy play. Note: This interview was conducted in June. The entire 21m subtitled interview can be watched at Team Acer. What part (time) are you reffering to? I enjoyed this a lot, thank you very much for sharing! edit: so I'll just have to say thank you here. Why is it only released now? Because of the fact that he's basically guaranteed for Blizzcon after WCS EU? I feel bad for the translator lol. Great interview as always though!